Pepper production is currently re-surging as top chefs around the world have rediscovered the uniqueness of Kampot Pepper. As one of the main agricultural products this region has to offer, a visit to a pepper farm is high on many people’s lists. 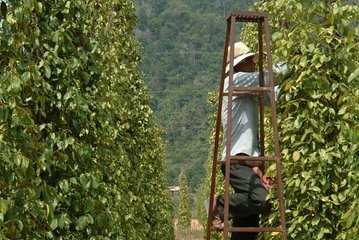 Pepper farms are dotted throughout Kep and Kampot and we can include several other sights in this tour. Please indicate to our consultant what your interests are and we can help you pick the right farm for you to visit and build a trip around it.